As usual, the track was a 16 LANE (mirrored 8-lane each direction), another extremely challenging layout, including many R-1's. 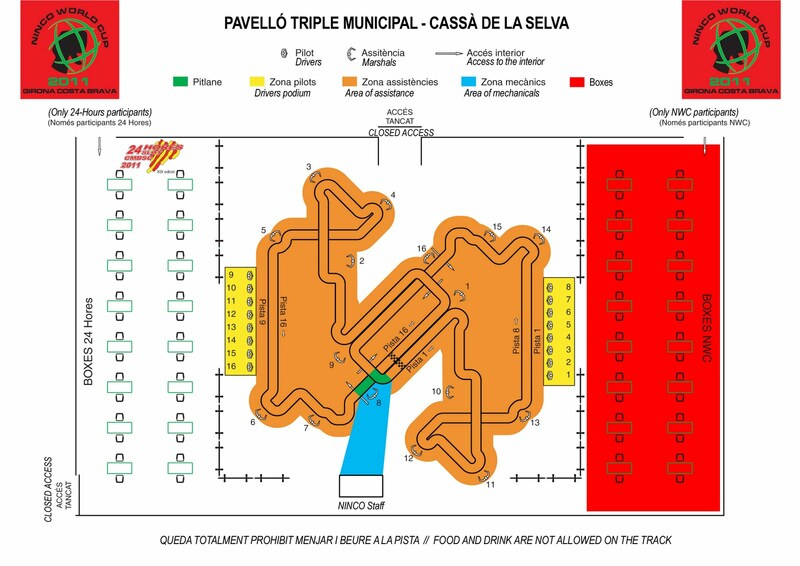 8-Driver positions on each side of the layout. My congratulations to "Spain, Palau" for their double victory... both 1/32 and XLOT! 1/32 Ninco Sport: Final results. additional information about the NINCO World Cup and its history can be found HERE! Last edited by NINCO1; 09-12-2011, 08:47 AM. Geez . . . How big was the room this was held in? They use a gym? At 16 lanes that had to be monsterous! Last edited by NINCO1; 09-13-2011, 06:25 AM. Each track was 204+ feet in lap length; 51 feet of corners, 153 feet of straights. Main straight was 30+ feet. Total track area, both tracks was about 4800 square feet. Roughly the size of a basketball court.